The main goal of Krystian is to provide our Customers with the highest quality work clothing. With regard to the above, we offer buyers the customisation of our products to their individual needs, irrespectively of the selected model and lengths of series. We produce clothing to order, of particular personnel sizes, with ordered logo. We design individual models of clothing, fit to individual Customers’ expectations. The order performance starts from individual analysis of risk and safety requirements, through individual evaluation of workers’ comfort, needs related to visual identification and functionalities (to make the clothing best-fitting and optimal for application), to preparation (as per the needs) and application the graphical mark (logo) to ready-made clothing, distinguishing this series of clothing. These tasks are completed by dedicated professional departments of Krystian: design department, visual identification department and marking department. Preliminary sheets of ordered designs prepared by our specialists are referred to production after relevant tests and consultations with Customers’ expectations are completed. Maximum functionality of final products is combined – at explicit customer’s request – with full product customisation (e.g. marking individual pieces of clothing with workers names). 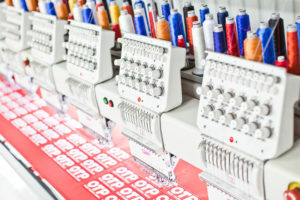 Clothing is marked through computer needlework, thermal transfer method or sublimation printing. We warrant high quality and aesthetics of markings we manufacture. We offer the possibility to create individual logo from the beginning to end. i.e. from the preparation of unique design of the logo through its manufacturing and application. We also ensure the possibility to sew identification bar codes and chips into the clothing.